EXETER, BEDFORD, AND WESTMORELAND; THE KING, SCROOP, CAMBRIDGE, GREY, AND ATTENDANTS. K. Henry. WHY, how now, gentlemen? What see you in those papers, that you lose So much complexion?look ye, how they change! Their cheeks are paper.Why, what read you there, That hath so cowarded and chas'd your blood Out of appearance? Grey. Scroop. To which we all appeal. 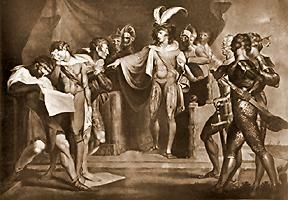 Painted by Henry Fuseli, R.A, Engraved by Robert Thew.